Austin Aries shocked a lot of people when he walked out of Impact following his main event loss to Johnny Impact at Bound For Glory. 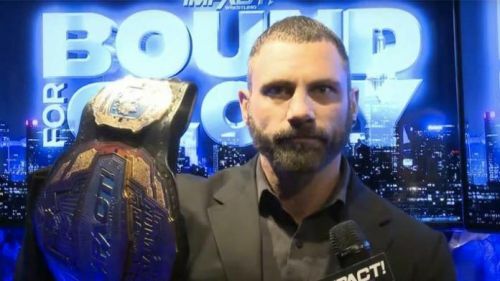 One of the biggest non-WWE wrestling stories from the latter half of 2018 involved Austin Aries losing the Impact Championship to Johnny Impact and then proceeding to walk out of the company. MIke Johnson of PW Insider Elite radio discussed the situation stating that Aries was likely to be fired anyways so he walked out before he could be shown the door. Wrestling-Edge.com carried a transcript of the audio show. After Aries was released by the WWE, he began a journey of belt collecting all over the world. The trip included appearances in Ring Of Honor and mainly in Impact, where he defeated Eli Drake on his first night back in order to win the Impact Championship. He aligned himself with Moose and Killer Kross and had a stranglehold on the title until he was challenged and defeated by Johnny Impact at Bound For Glory last October. Aries actions after the main event of Bound For Glory shocked the professional wrestling business. He no-sold Impact's finishing move, jumping right back up after the three-count. He then proceeded to flip off Don Callis and management on his way up the ramp. Johnson provided some insight as to how and why things went down the way they did. Johnson also noted that even though he was slated to drop the belt that night, Impact still had plans for him going forward after Bound For Glory. Johnson added that Aries left the company that night after dropping the title. There was also an altercation between Aries and Impact at the Impact Hall of Fame Ceremony where Abyss was inducted. Aries hasn't really been wrestling in a featured capacity in any of the larger promotions across the world. Aries has worked for most of the major wrestling promotions in the US including Impact, ROH and the WWE. With AEW starting up, maybe he might get a shot there depending on his relationship with Cody and the Young Bucks. Whatever happens, he's an extremely talented guy in the ring and on the mic but he might have burned too many bridges in order for bigger companies to take a chance on him again.